I love it when God gives little promptings! Week before last, Doug was glancing at the weather forecast. He said, “Monday needs to be a zoo day.” So, we planned to grab those membership cards and head to Memphis for the day, if the forecast held up. And hold up it did. Oh my goodness! After the insane heat we’ve had – and now have again – last Monday was absolutely, incredibly perfect! Doug blessed me with a stop at MDO on our way, so I got to get some hugs from some awesome ladies. That place is like a haven in the middle of a city I just don’t like very much. It was such a blessing to see everyone again! Then after a few more errands, we headed to the zoo. First stop, the picnic tables! This trip was officially our school year promotion celebration. It marked the end of 4th grade, 2nd grade and preschool, and the beginning of 5th grade, 3rd grade, and KG. I made a giant cookie for our picnic for a little extra celebration. Then it was off to see the animals! It was a really neat day to be at the zoo. A lot of the animals were more active than we’ve ever seen them, and we got to enjoy several “firsts.” The hippos are usually just resting in their pools, but we managed to hit lunchtime this trip. Then there are the pandas. They are always sleeping when we go. But, this time we got to see this panda up and eating! And, boy was he ever intent on his lunch. It was truly fascinating to watch him work through his bamboo. We also managed to see the rhinoceros moving around, which was a first. He’s usually hiding in a back corner, almost blending into his surroundings. Steven wanted to see the komodo dragons, and we stopped to have a chat with the giant turtle. Another first was our visit to the enclosure where you can actually feed the birds. To get in to see the birds, you first pass through a honeybee exhibit, which fascinated the kids (and Mommy). This is a glass-encased hive with a tunnel of sorts leading from the hive to the outdoors. I think I could have stayed there watching the bees (and hunting for the marked queen) for quite some time! Then you get out where you can buy sticks of birdseed that the beautiful birds will come and perch on for a nice meal. It took a few minutes for everyone to catch a bird, and no one caught one of the beautiful blue birds. But, it was fun to get to feed these! We love the new exhibits where we can see the beautiful gray wolves and grizzly bears. But, a Memphis Zoo trip is not complete for us without stopping to say hi to the polar bears. Oh how we love these fun and beautiful creatures! The neatest thing about this particular visit was that in school we were just in the process of learning about how light bends when it hits water. Being able to watch the polar bear both above and below the water was a perfect example to the kids of this phenomenon. I love this picture where the body looks like it’s a yard away from the head! The kids were troopers and had such fun. But, they were also thankful for a strong daddy as we were headed out after a fun tour. After all, they had to save their energy for one last stop. They all had their money with them and really wanted to buy something at the gift store. So, we made that our last stop on the way out. I love what they all picked out! They loved the wolves we had seen, and decided that they each wanted to take a wolf home. They were each drawn toward completely different wolves, which I thought was really sweet. May I introduce (from left to right) Wolfie, Belinda, and Lizza, our beloved new stuffies. Another fun zoo trip in the books, and a new school year kicked off with a great celebration. 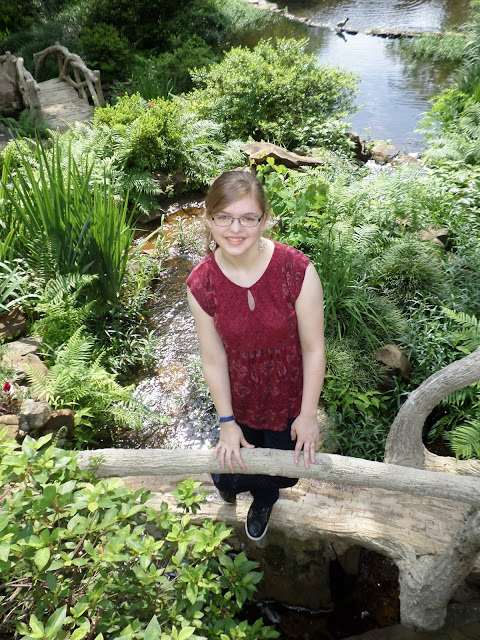 I celebrated my 13th birthday at the Memphis Zoo. That was long ago! Our zoo used to have a very prolific polar bear breeding program. Unfortunately the mama bear died several years ago. It was always my favorite exhibit! Amazing picture of the polar bear - that's some serious refraction!